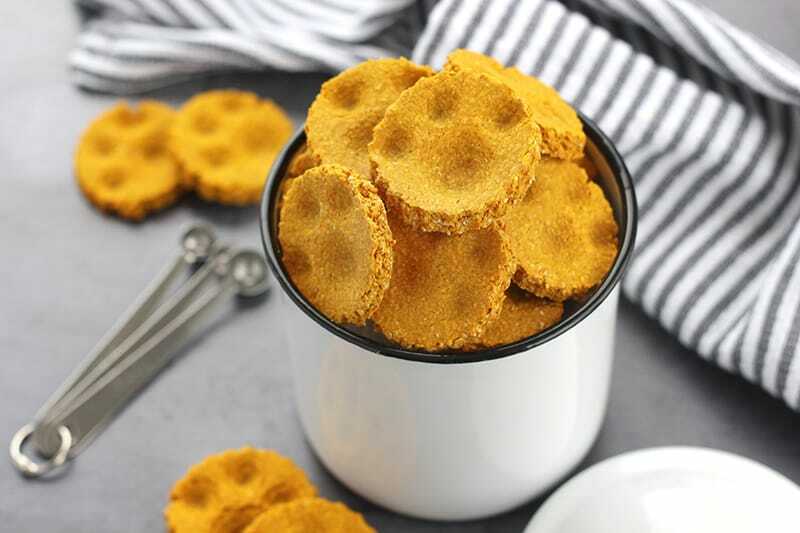 These homemade Pumpkin Dog Treats are the perfect fall cookie for your furry friends! 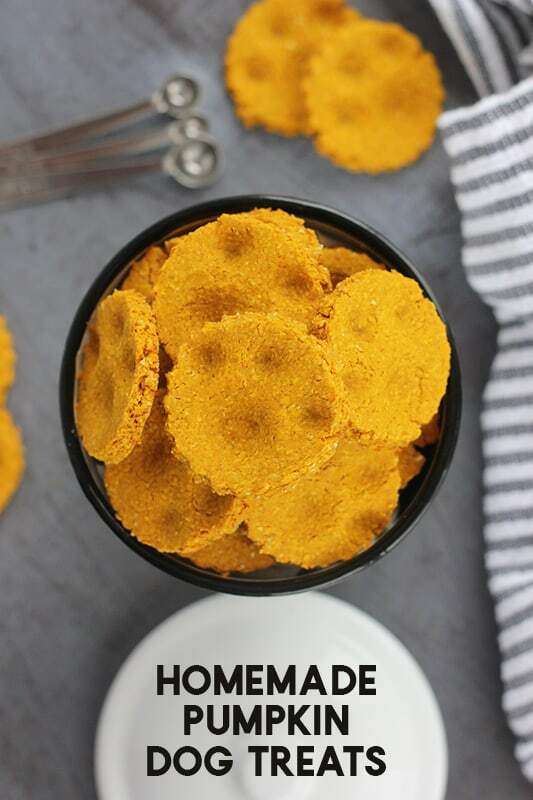 Made with pure pumpkin, eggs, peanut butter, and oat flour! Show of hands, who has a furry four legged friend running your household?? We were lucky enough to welcome a small little schnauzer at the beginning of the year and he has easily become everyone’s favorite family member. He keeps me company while my little guy is at school and has become my sons shadow whenever he is home. We just cannot control ourselves around the little fluff ball. If you follow me on Instagram you have probably seen him make a few appearances. Harvey is the best. We could not imagine life without him. We also want to spoil him rotten which is where this recipe came from! One thing we learned about the schnauzer breed is that they are at a higher risk when it comes to diabetes which has us super careful about what goes into his little belly. 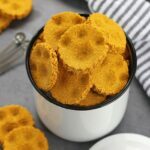 This recipe is perfect because it combines a few super healthy ingredients and gives them a homemade treat that does not have me worried about the long term results. *Note: While these ingredients have been approved by our veterinarian, I suggest consulting yours before you feed your dog any human food. Instead of wheat flour I decided to use an oat version. Oats are good for their digestive system and full of soluble fiber. Now, I know you are probably asking where you would get this?? Good news is you can make your own in about 5 minutes. Add 1 cup rolled oats to high powered blender or food processor. Pulse until a powder like consistency. This is actually a great alternative for dogs that have a wheat allergy. Another great ingredient int his recipe is the pumpkin. Pumpkin has a lot of the same dietary benefits as oatmeal but ads a great scent and taste to the treat. I decided that small round cookies were going to work the best for my small breed dog, but you could make these any size or shape you like. A pumpkin shape or bone would be fun. 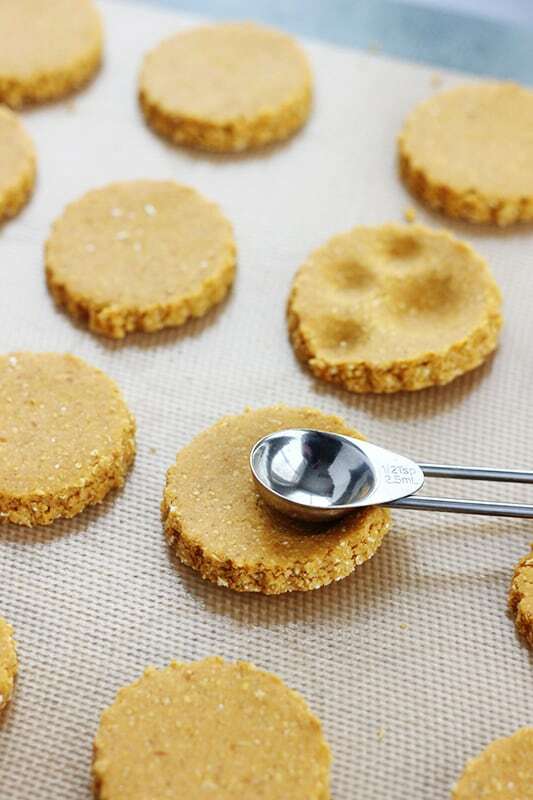 I also used the back of a teaspoon to create cute little paw prints right on each cookie before putting them into the oven for a cute extra special touch. Let your treats cool completely. Place in a quality air tight container and store in the pantry away from moisture. This is the best way to store if they will be used quickly. Another alternative is to place them in a zip top bag and freeze. 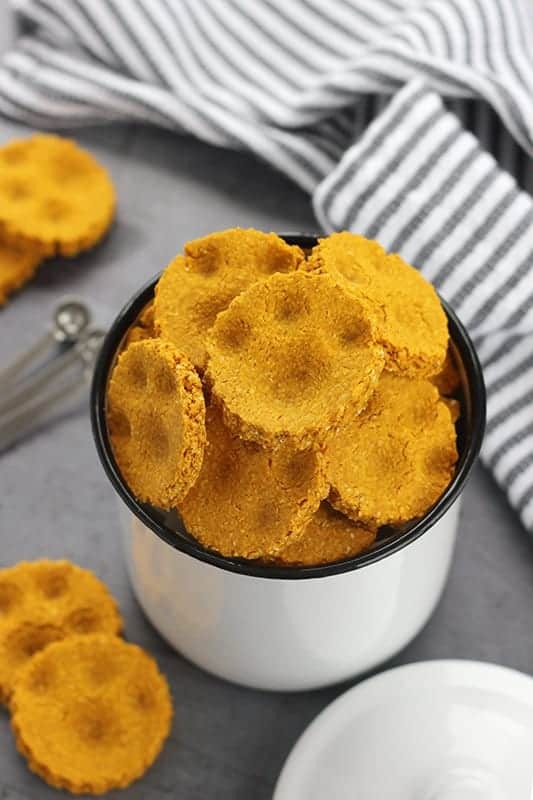 If you are storing them in your pantry, DRY homemade dog treats will last 2-3 days. In the freezer, if stored properly, they should last up to six months! Like this recipe? You will love my Pumpkin Pie Granola, Pumpkin Cheesecake Bars, and Homemade Pumpkin Spice Coffee Creamer! Harvey has been loving these tiny cookies. I am pretty sure it took everything he had to not jump up and snag this out of my hand. So what do you think? Are you going to whip these up for your pup? 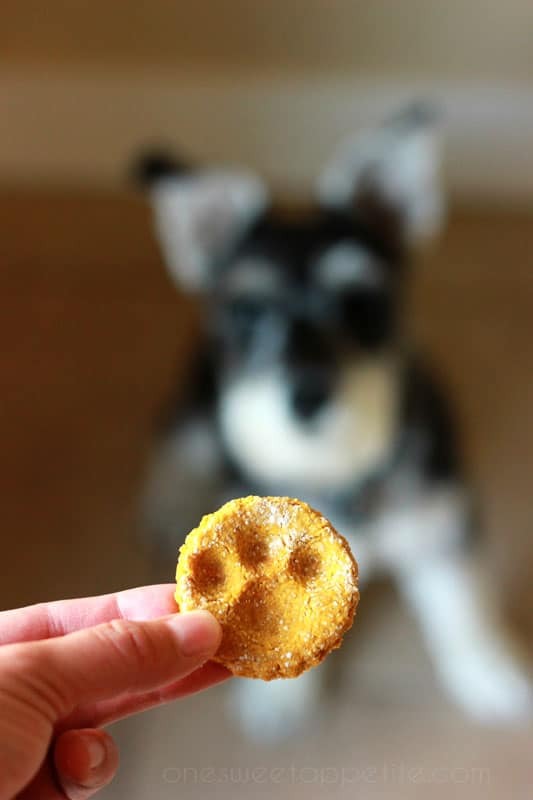 These easy homemade pumpkin dog treats are the perfect way to spoil your furry friends! 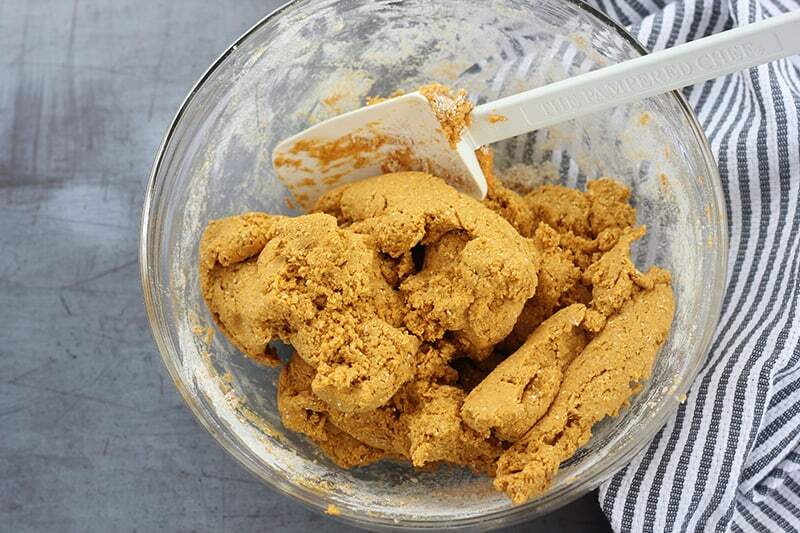 Whisk together your pumpkin, eggs, and peanut butter. Fold in 2 1/2 cups flour and the cinnamon. Add additional flour until the dough is no longer sticky to the touch. Roll your dough to 1/4 to 1/2 inch thickness. 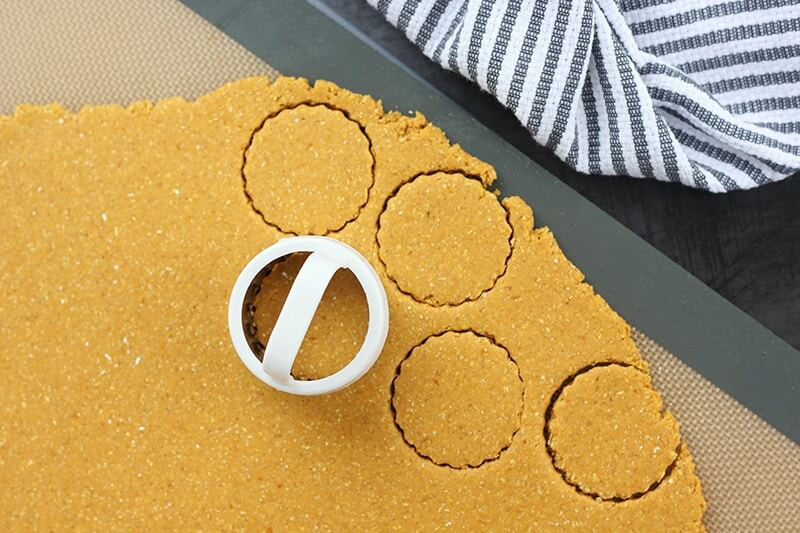 Cut with your desired cookie cutter. Bake 350 degrees for 20 minutes or until crisp. These are so stinkin’ cute!!! I love them, and Harvey is just too dang adorable! Thanks!! He is so big. This recipe was actually fun to make with dax. He loves to spoil Harvey. Just made these tonight…actually made a double batch, because I happened upon an excess of pumpkin purée. I put half of the dough in the freezer; we will see how it keeps, but I imagine it will do just fine. My pup Josie did the taste test and SUCCESS! I’m giving some to my neighbor’s pup and my co-workers’ babies. 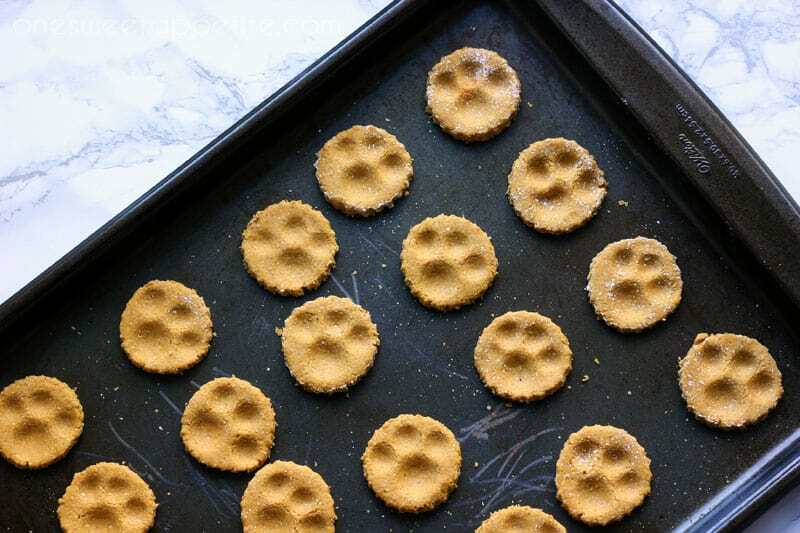 These are the simplest dog biscuits I’ve ever made. Thank you for the recipe! It’s going to be fun to add different veggies into this basic mix and see what comes out. If stored in the refrigerator in an air tight container they can stay good for up to two months. If in the freezer in an air tight container you’ve got about 8 months. Just bring to room temp before serving. Thank you for this recipe. I’m going to be making them for my neighbors dogs. I live in senior housing and most of the residents have dogs. I think all the dogs will enjoy them. Just wondering what other ingredients could I add to make different ones. I would like to make a few different kinds for all the dogs. Since many of the owners don’t have extra money for treats. Thank you so much all the dogs will love them. Thank you for this recipe. I have been looking for awhile now for an alternative dog treat since I read a post about the dangers of store bought treats. All of the other recipes that I have come across have either used expensive ingredients or they only lasted a few days. Do you think that they would be OK for cats too? I hope they work out for you! As for the cat question, I’m not sure. I would do some research before giving them to any feline friends. Remember to check your peanut butter for the poisonous (to pets) artificial sweetener they put in peanut butter. That is an excellent reminder! You don’t want to use any brands that contain Xylitol. Are these supposed to be super crunchy or still a little soft? We made a batch this morning and left them in the oven for 15 minutes but they are not super hard like normal dog biscuits so just wanted to make sure what the consistency is supposed to be. Thanks!! Ours were softer. You did it right. I love that you shared with you chickens! It’s one of my goals to get chickens as soon as we have a space for them! Hi Stacy. It depends on the size of the cookie cutter you are using. We got 12 large treats. wonderful and ez recipe! thank you for sharing!!! now, how did you get to stamp the cute paw prints? Cannot wait to make these for my little pup, who is also named harvey! He loves pumpkin, so I think these will be a favorite! What a wonderful name! We can’t wait for your fluffy pup to enjoy his treats! Can you substitute with coconut flour?? I have never substituted coconut flour in these. If you find that it works well I would love to know! 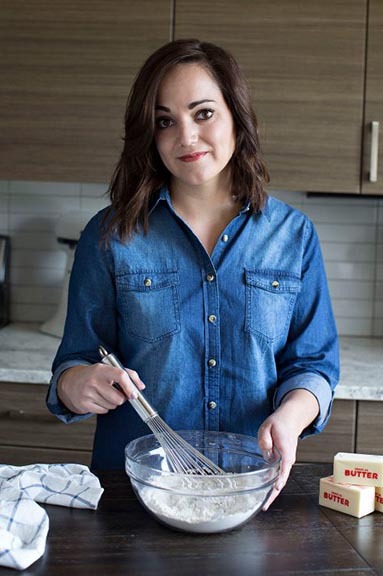 Thank you for this easy and puppy-approved recipe! I replaced the eggs with one ripe banana because I am vegan and therefore do not keep any eggs in the house. I also found that 20 minutes was my ideal baking time for these treats. My puppy loved these, and I loved seeing him enjoy them! What a great idea to substitute the eggs with banana. I am going to have to try that for sure! My pup is having tummy troubles lately (finding out she has a very sensitive system) and came back to your recipe (had it pinned). Nowadays it seems safer for the doggies to make yourself what you give them due to sensitivities and recalls. I chose to try it your way by making my own oat flour. I left it slightly coarse and they look delicious. I have spent the day doing a purge of anything that might be effecting her negatively. I am hoping your treats are the ticket to Baylee starting to feel better. Thank you for the all natural treat recipe! As a fellow dog mom to a pup with sensitive stomach issues, I applaud you for taking the extra steps to making sure your fur baby is taken care of. I hope these treats work out for your little one! I made these and my dog loves them. However, even after being stored in a container, 4 days later there was mold growing on them! Good thing I didn’t give them for Christmas! Yikes! I have never had that issue. Something I will have to look into. Glad you didn’t give them away. I do suggest storing them in a quality air tight container or in the freezer. I have personally never used coconut flour. However, my vet has told me that it is a healthy option for our dog. I’d say that it is up to you and what you think is best for your pet. It should work similarly in this recipe.